The catering market is big business: $52.3 billion, to be exact, 64% of which goes to restaurant catering, according to Technomic, and people are now spending more money on restaurants than groceries. Those numbers are only expected to increase in coming years, meaning now is the time to consider adding catering services if you don’t already—and if you do, it’s time to maximize your profits by promoting those services online. When your restaurant offers catering, you’re able to reach more potential guests and convert them into regular customers. Of course, your restaurant can gain exposure online and through other marketing efforts, but catering lets people get a taste of your menu who might not have otherwise stepped foot in your restaurant. Make sure to bring business cards and takeaway menus to any event you cater, and ask the event planner if you can display a sign-up sheet for your email list. Also, it’s a good idea for your waitstaff to know your website to refer curious guests there to learn more about your offerings. 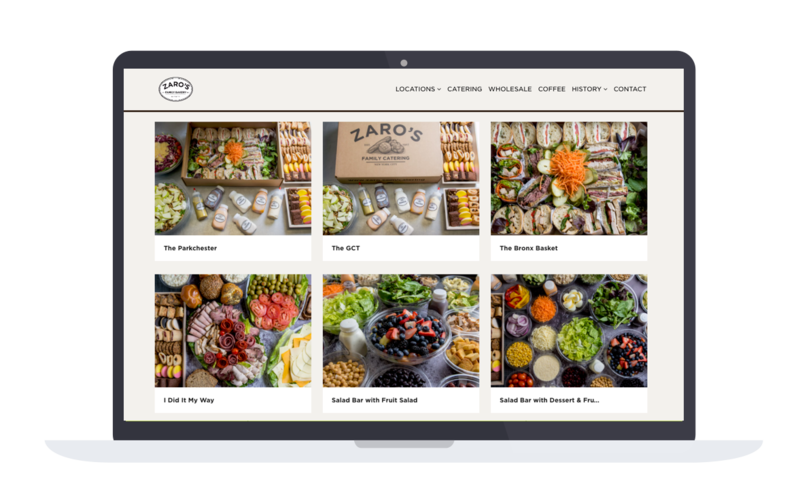 Guests can select what they want catered on Zaro's website. It’s hard for any food business to perfectly predict optimal inventory levels—you might come close using historical data, but still, it’s nearly impossible to know the exact amount ahead of time. With catering, though, you can order perishable ingredients with significantly more accuracy—especially if you require a specific amount of advanced notice when guests hire you. Being able to control how much food you order helps reduce your overhead food waste cost, since you’ll know exactly how much food you’ll need ahead of time. Think of catering as a secret revenue weapon for your restaurant. For starters, you can have strong cash flow by requiring guests to put a deposit down or pay in full before you order inventory—one of the few times a restaurant can have cash in hand in advance. Another money saver to consider is that most catering orders don’t require the same amount of operational costs as running lunch or dinner service. The event planner is usually in charge of logistics in the space, and wait staff might not even be needed for some events. Set your restaurant apart by offering catering and clearly promoting it on your digital channels like social media, website, and email newsletters. 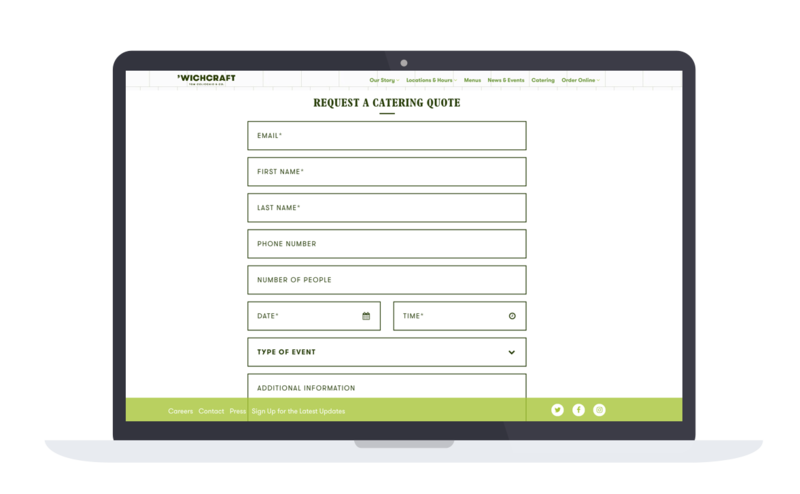 The catering inquiry form on 'Wichcraft's website. If catering sounds promising to you, but you aren’t sure how to promote it, BentoBox makes it easy to sell your catering services straight from your website. You have the option to add a pre-order catering store and/or a custom catering inquiry form. With the pre-order store, you set all the food options, guests add them to their cart, and specify the date they want the food delivered or picked up. With the custom form, guests are able to inquire about special catering orders. No matter which catering option you choose for your website (or both! ), you can easily manage and build all your catering events through the BentoBox backend. The more you promote your catering offerings, the better. So be sure to let your guests know about your catering program through social media channels and in email newsletters. You can even have it right on your homepage so that it’s one of the first things visitors see when they enter your website. The more you spread the word, the bigger the benefits. So go ahead, ask us about our catering features!